We offer several types of high quality custom built beadboard cabinet doors. Most of our beadboard cabinet doors feature solid wood center panels for the smoothest beads that require no additional preparation for painting or staining. Our beadboard cabinet doors are available with bead spacing of 1 1/2” center to center of bead, if you require a different bead spacing feel free to contact us for additional information. Beadboard cabinet doors can be made with arch or cathedral tops as well as with applied mouldings. What are beadboard cabinet doors? There are several types of cabinet doors that can actually be classified as beadboard cabinet doors. The first is a very basic slab or flat cabinet doors that has beads cut into the front of the cabinet door. This is nothing more that a flat board, sometimes made up of several narrow boards to create the desired width that has beads cut into the front. Most commonly these beads run vertically. 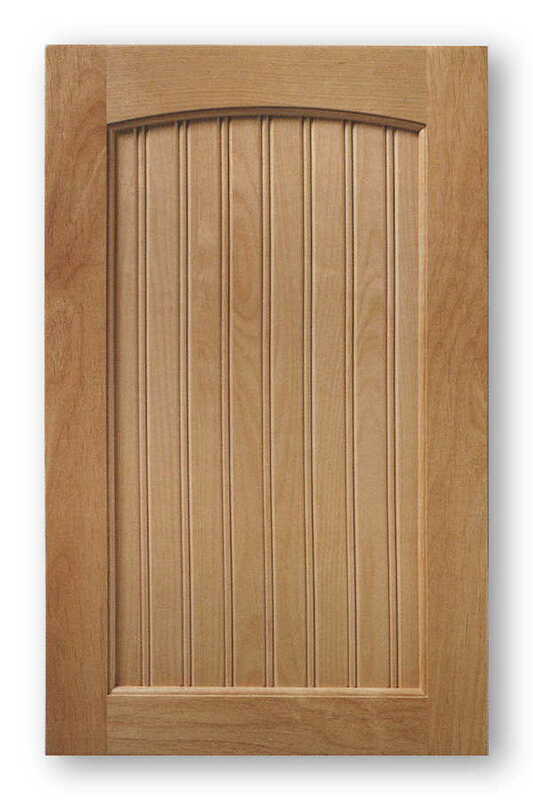 The next and most common style of beadboard cabinet door is the traditional 5 piece cabinet door. Comprising of 4 pieces of wood for the styles(vertical pieces) and rails (horizontal pieces) and of course the center beadboard panel. This method of cabinet door construction has been around for centuries. The cabinet door frame is grooved on the inside and captures or surrounds the center beadboard panel. Building cabinet doors in this manner allows the center beadboard panel of the cabinet door to “float”, or to allow for the expansion of the center beadboard panel. This is more important when the beadboard cabinet door panel is made from a solid wood. Even composite materials such as MDF which is used regularly for beadboard cabinet doors with expand and contract with changes in temperature and humidity but it is far less than wood. Quality beadboard cabinet doors will have a center panel that is slightly smaller than the opening to allow for the expansion. Beadboard cabinet doors that are made with a panel that is the same size as this inner opening have a likely chance of expanding too far with a great enough force that the door can split apart at the stile/rail joint. Beadboard cabinet doors can be purchased in as many woods that are available in flat lumber. Beadboard cabinet doors can be made from composite materials such as MDF, and there are several manufacturers that offer plywood beadboard. 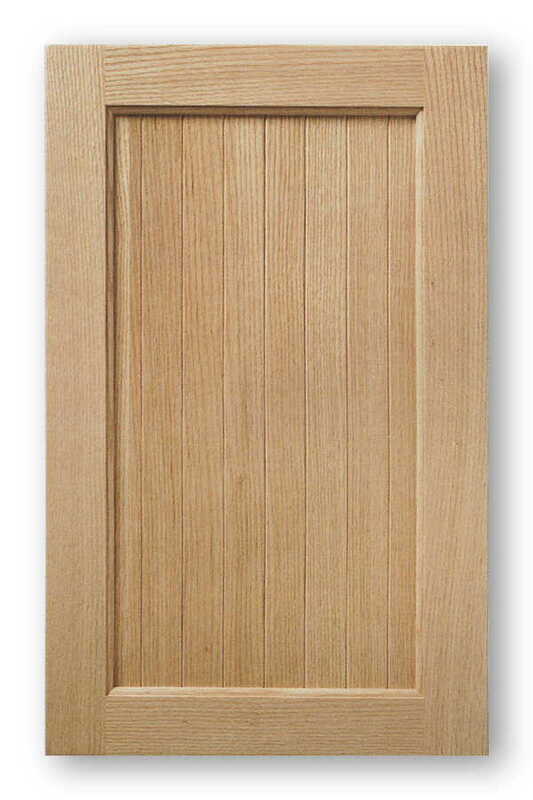 This plywood beadboard is used widely for paneling or wainscoting, but can be easily adapted to beadboard cabinet door applications. Of course beadboard panels do have a quality variance especially when it comes to plywood beadboard. The better materials have a thick top veneer in which the beads are cut into thereby eliminating cutting into the underlying layer of cross grain plywood material. With lesser quality beadboard sheet materials you will see this “cut through” to the second layer of material, depending on its application, it usually requires manual sanding of the beads to smooth them out. Materials such as MDF beadboard need only a fine sanding to remove the “fuzz” created by the cutting of the beads. Sometimes this sanding step can be done after a primer is applied, the primer helps lock in some of the MDF fibers. Care must be taken not to sand through the primer or sanding off the primer, in that case a re-coat may be necessary. The type of wood you select for your beadboard cabinet doors will take into account whether they are to be a paint grade beadboard cabinet door, or will they be stained and finished wood cabinet door. Almost any wood can be used to construct beadboard cabinet doors, from domestic standards such as oak, maple, cherry, alder, all the way to the more exotic imported hardwoods. There are numerous styles of five piece beadboard cabinet doors, the plain square top, arched top (sometimes called a roman arch or juliano arch), a cathedral arch top, and the deluxe versions where there is an arch on the top and bottom of the beadboard cabinet door. Even a provincial style beadboard cabinet door is possible where there is a left and a right sculpted arch similar to that found on armoires and furniture. Beadboard Cabinet Doors can be crafted to the sizes you specify, making it easy to get beadboard cabinet doors to replace your old kitchen cabinet doors, bathroom vanity cabinet doors, new cabinets or other furniture item. I have an older home in Atlanta, Georgia that has some of the traditional touches seen in the Atlanta area. I wanted to further emphasize some of the historic architectural details by refacing my existing kitchen cabinets. Since the look I was going for was a painted finish all I needed to do was to replace the cabinet doors and drawer fronts with new ones. While we were in there I also changed out the cabinet drawer boxes with new ones. The door style I chose that went very well with our home and decor was the inset panel beadboard cabinet door. 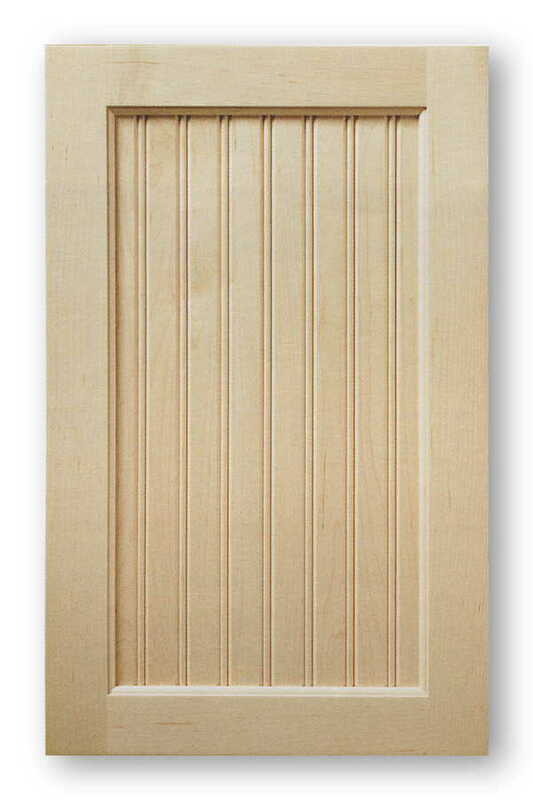 These beadboard cabinet doors are very reminiscent of a lot of the beadboard you sometimes see in the Atlanta, Ga area. Im sure you can have beadboard cabinet doors made from a stainable type of wood, but I’ve always seen it painted and thats my favorite look for my kitchen project. Beadboard kitchen cabinet doors that can be painted can be built with an MDF center panel or you can get them with a solid wood beadboard panel. Either one of these type of beadboard cabinet doors work very well for painting. I decided on the solid poplar wood beadboard cabinet doors. Another thing I added to the custom beadboard cabinet door order was a wainscoting style end panels made from the same solid wood beadboard as the cabinet doors. I used these on the smooth ends of the cabinets and back of the island. Now these wainscoting beadboard end panels match the kitchen cabinet beadboard doors. By adding beadboard cabinet end panels to the cabinet ends gives it a custom cabinet look and makes it look like we had a lot of money and a ton of hours in its construction. I also replaced the slab cabinet drawer fronts with beadboard cabinet drawer fronts that match the beadboard cabinet doors. Im sure I could have used a square slab poplar drawer front but I have several cabinet drawer banks with wider bottom drawers so I felt that kept the beadboard theme going in the kitchen. I also used a beadboard cabinet drawer front for the false front for the sink cabinet. This is just screwed to the cabinet face frame. Some people may have gone with the drop down drawer front tray, that was something I doubt I would have used so I kept it simple. During the mild kitchen renovation I replaced all of the cabinet drawer boxes with new maple dovetail drawers with the soft close drawer guide option. I really love that feature and I showing off those beautiful dovetails is a plus. I capped the kitchen refacing project with some pewter finish handles and knobs. There are a few minor things left such as the new poplar wood crown moulding and base board, but once those details are done ill have a wonderful beadboard kitchen. In the right kitchen with the correct lighting there is no doubt that white beadboard cabinet doors can look fantastic. When everything is done in the right way your kitchen can easily resemble that of one for show in a factory and it is all because of how spectacular this white finish can look in the right situation. First, it is important to talk more about the color itself as it does add an extra something to a style of door that is already attractive to look at. White is quite a pure color, and when it is used in a cabinet door it just gives it a certain crispness and this can then help make the kitchen feel lighter as a result. You will also find that it works well with subtle lighting in the kitchen as well as the beadboard will create shadows on the door itself and the end result is something that is exceptional. When it comes to the bead part you do have several options. Most people go for the slightly raised effect creating a rectangle in the middle of the door with the same shape replicated on the drawers in order to provide some uniformity in your kitchen. However, this does give you quite a clean cut, relatively modern look, as modern as this style can be in any case, but there are other options whereby the doors are going to be perfect for a more traditional, old-fashioned style of kitchen. With this older style you will tend to find that the beadboard will be curved at the top and it generally flows a bit more especially when compared to the more rigid form that was mentioned earlier. This can still look amazing, but only if the rest of your kitchen ties in with this style or things will quickly look disjointed and you will certainly not be happy with the end effect. What you need to do is to look at things such as the rest of the décor, look at those little objects that you can use to decorate a room, and even look at the size and amount of light that comes in. This type of door is perfect for those smaller rooms where a lot of artificial light is required as it does help bounce the light around making it feel more spacious as a result. Do give some serious thought to the countertop as well because in all honesty you are best to go for something that is quite dark in color to act as a counterbalance with the lightness of the door, so go for a dark wood color or in some cases almost black would suffice although this does depend on personal preference. So if you want to have cabinets that come with a glossy, classy finish, then do give some serious consideration to white beadboard cabinet doors. When everything has been installed you are going to love the end effect and with those predominantly straight lines with the beadboard you will have doors that catch the eye and provide you with a kitchen that both you and guests are going to love. Have you ever wondered how to get the look of a high-quality white custom bead board kitchen that you typically see in southern homes? 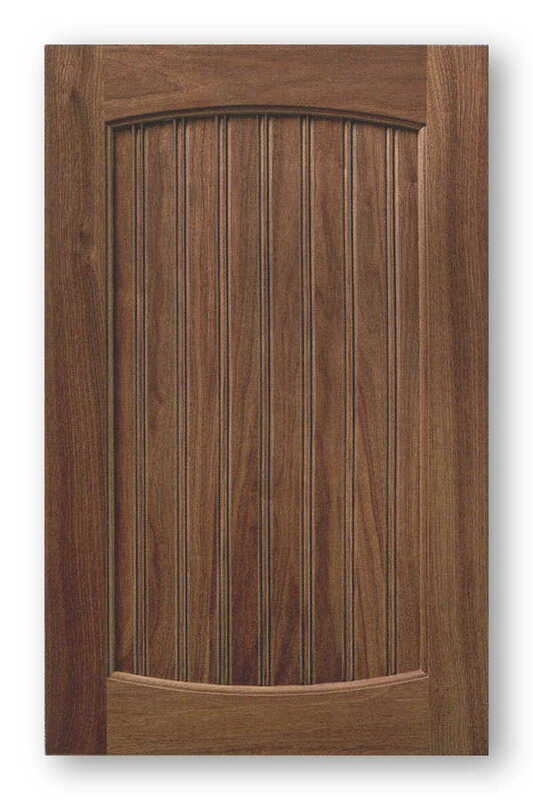 Achieving this type of the bead board cabinet door look is not all that difficult. There are many ways of achieving this look and being able to do so quite affordably. You will be quite surprised at how easy it can actually be. When attempting to achieve this type of look in your kitchen you have numerous options. The first potential option is to completely remodeled kitchen which would involve removing all of the kitchen cabinets and starting from a blank slate. This option is of course a very expensive option as entire kitchen remodeling is a very costly and complex undertaking. If you are happy with the layout of your existing kitchen cabinets the more popular option would be to simply install new bead board kitchen cabinet doors. By simply replacing your old kitchen cabinet doors with custom-made the bead board cabinet doors you can save yourself all of the associated troubles that go along with entire kitchen remodeling. Now there are several ways you can go about replacing your kitchen cabinet doors. One way is to hire a kitchen cabinet refacing company. Kitchen cabinet refacing companies specialize in removing your old kitchen cabinet doors and install new ones. Refacing companies will typically handle the entire process of cabinet refacing from start to finish. Although this is one option you will quickly find that kitchen cabinet refacing can almost cost nearly as much as remodeling your entire kitchen. Most homeowners and weekend warrior, DIY types can simply tackle the process of cabinet refacing themselves. Cabinet refacing is well within the scope of most handy do-it-yourselfers. The money that you will save by tackling your own kitchen cabinet refacing will be well worth the effort put forth. The first thing that you will need to begin this process as a do-it-yourselfer is to carefully measure for your new bead board kitchen cabinet doors. The measuring process is critical in order to achieve a professional look. During this time of measuring you may want to consider brand-new kitchen cabinet door hinges which is typically replaced at this time. Depending on the age of your kitchen you may currently have hard-to-find or obsolete cabinet door hinges that will be difficult or if not impossible to replace in the future. It is always best and recommended by numerous professionals that you replace your cabinet door hinges with European-style hinges. European-style cabinet door hinges are quite universal and use a 35mm inch hole that is bored into the door. By using European-style cabinet door hinges on your cabinet refacing project you will find that if you ever need to replace the hinges in the future finding a replacement will be easy. Once you are done determining what type of cabinet door hinges you will need you can simply measure accordingly to order your brand-new custom built bead board kitchen cabinet doors.